It’s hard to believe that it has been five years since Camacho was acquired by Davidoff, but it’s true. And while Davidoff has managed to keep the sticks rolling out of the factory in an almost seamless manner, the intervening years have provided new opportunities for Christian Eiroa. Asylum and Asylum 13 are some of the results. Asylum Cigars are a joint venture of Kevin Baxter and Tom Lazuka, who were later joined by Christian Eiroa. Eiroa formed Tabacaleras Unidas last year as the parent company for several brands including his own CLE and CLE Cuarenta brands, and it appears that Baxter and Lazuka have, well, taken Asylum there. Asylum Cigars are rolled in the old Tabacos Rancho Jamastran factory in Honduras, a familiar name to Camacho fans. 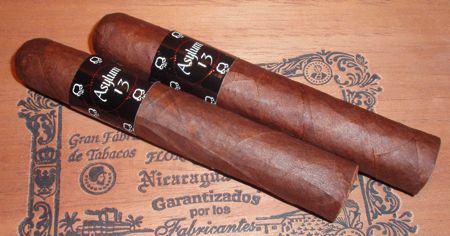 The Asylum 13 is a Nicaraguan puro featuring a dark habano wrapper. The cigar is made in four gobstopping sizes, with the 50-ring Fifty being the runt of the litter. 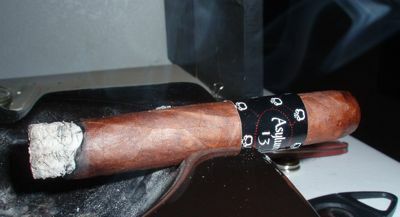 The Asylum 13 has a slighly oily maduro wrapper that appears quite smooth despite a few prominent veins. The cigar is solidly packed but draws very easily. The burn is even and the ash holds well. This is a fairly boisterous cigar from the first few puffs to the last. It introduces itself with a potent dose of red pepper and a strong, almost stinging, woody aroma. After an inch or so the spiciness wanes enough to detect more subtle flavors — some earthiness comes through to complement the woody flavors, and there is coffee or cocoa on the nose. A touch of anise appears at times, but fleetingly. The smoke texture is medium to full in body, but this full-flavored cigar is a brawler from the start. I’ve read a few reviews that state the larger sizes are even stronger, so I think I’ll be sticking with the 50. One of my favorite cigars from the old Camacho days was the Diploma, but I rarely smoked it because it would invariably leave me on the floor. 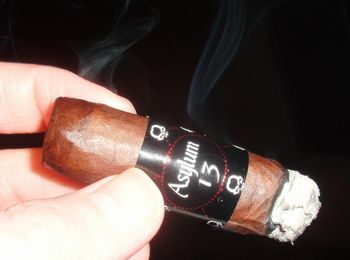 The Asylum 13 isn’t quite that heavy (nor is it quite as complex) but it’s still a tasty cigar with excellent construction. I hope to find similar flavors in the non-13 Asylum, perhaps with a little less power and a little more complexity. Judging by the box counts, Asylum 13 is geared for brick-and-mortar sales. The Fifty and Sixty are sold in boxes of 50 cigars, and the Seventy and Ogre are available in boxes of 30. I picked up the Fifty for around $5.00 a stick, which is pretty economical for a boutique smoke. I really enjoyed the 50’s that I had, and will pick up more. The 60’s, and especially the 70’s, are definitely out of my comfort zone. My buddy Mike at SR did smoke the 7×70 and didn’t seem to think it was all that strong, and he usually hangs out in the mild/med zone, but he did seem to feel that all that filler threw it a bit out of balance. The Asylum 44×4 is my new fav short smoke. It is pretty strong for a small cigar and has gobs of hickory and black pepper. I plan on smoking the rest of the regular line and then move to the 13s. Can’t wait!! Thanks for the review. Sounds like one I’ll have to try — your description sounds a little like the illusione 68. A great short smoke, but a little too pricey for me. Maybe the Asylum will turn out to be a good alternative. Drudog21 – Thanks for your comment. It inspired me to try out the 4×44, and I’ve really been digging on them ever since. Along with the Tatuaje Reserva Petit Cazadores and the Illusione Rothchildes, they are now a staple short smoke for me.